First of all, congratulations, the people of America has spoken up and put their opinions to great use. But, you have such responsibility now keeping us under your wing. I have many concerns for you as far as you doing your job. It has come to my attention that gender stereotypes are all over the world to this day. Girls and boys should act and do things a certain way that is socially acceptable; and if they defy it, then they are considered a “freak” or they get ignored. Girls should have pink as their favorite color, boys, blue. Girls, long flowy hair, boys short. Boys get trucks for presents and girls get dolls. These are the most common ones and I know I find them very offensive; we need to educate the people. Gender stereotypes encourages others to judge people based off of gender norms. You hear it a lot from little kids, the youth. You walk past a girl with a pixie haircut and she is wearing a black T-shirt, and your son or daughter asks you if that person is a boy. These stereotypes are started at an early age and proceed through the teenage years. This is when some are starting to realize that boys and girls are not what was perceived when growing up. Personally, I have been accused of being gay, by what I have bought at a store. I went to the mall once, and I came into this one store that both provided men’s and women’s clothes. I saw this California Republic T-shirt that I really wanted, but I felt discouraged to get it because it was in the men’s section. I ended up getting it, because the colors just looked really good. I went to go pay for it and the cashier said, “Would you like to buy a four ounce of cologne for only 10 dollars?” I felt so embarrassed, I just said no and ran out of the store. Stereotypes push `people into categories, invisible boxes that group you up. 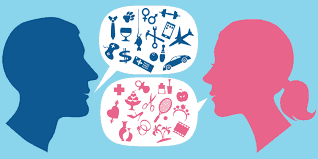 Gender norms are not only by how one looks but what they say. If a girl says no, they are classified as “mean,” I have seen this one more often than you think. Girls are supposed to be “nice”, meaning lenient and obedient, not assertive and firm. If men are not in charge and the decision-makers, they are considered weak and if this role ever gets switched its always looked down upon. Strong women around the world are described as aggressive and most of the time, it has to do with stereotypes of how women should behave, and what obedient looks like. Another stereotype that pushes people to think that women don’t do hard work because they are frail. This “norm” effects a women’s health, self-esteem and social status. Women that go to the gym and go to the weights section are looked down upon, men giving them a hard time to shoo them away. More women than men participate in cardio workouts. As opposed to men, who “dominate” the weight room. I volunteered my time and worked with them last summer as a custodian. Up to my knowledge, I have seen people do this on a daily basis. People who defy that gender norm do get stared at and try to indirectly belittle them by challenging their skills. Women’s health magazines merely focus on how to lose weight and tone up while men’s dial in on how to gain muscle and make protein shakes. As a society, we shouldn’t group people, in other words, put an invisible box around them, we all are equal, and deserve to be an individual. Stereotypes get in the way and block the true colors of people based off of the information you gathered about gender norms. It makes you think you already know what the person is about. This is something that you can’t fix, but your influence can change the way people and media perceive ideas. Fixing these norms, we need to have more protests out there to get the point across. Having community events once a month encouraging others to break the perceived normality of these stereotypes. Standing up today against society is the only way to get this problem fixed. You have to start somewhere like a community park, a city monument, somewhere that is “famous” around you. Coordinating an event for this problem is a wonderful start to get your voice heard. It then moves to bigger places like getting the mayor involved and soon around the state, talking at an event as far as state fair. You will open up people’s eyes, and group companions. Gender norms are harmful, limiting choices and passions for boys and girls. Changing the way society thinks cannot happen overnight, but with the ideas above, it will create different perspectives and spark proposals, especially with your help, President. Why Gender Norms Should Be Demolished by Justine Ann Yarbrough is licensed under a Creative Commons Attribution-ShareAlike 4.0 International License. I really enjoyed reading your article on Gender stereotypes. I was able to relate to this because I strongly support all genders and their decisions in life. I agree with you when you wrote, “If men are not in charge and the decision-makers, they are considered weak and if this role ever gets switched its always looked down upon. Strong women around the world are described as aggressive and most of the time, it has to do with stereotypes of how women should behave, and what obedient looks like.” I honestly feel like both Genders are entitled to their own opinion and should do what they feel is right in their case. I’m really glad you decided to write about such a topic and I look forward to what you have in store next.